Baseball season is a long one, and I’m starting to feel it. This happened last year, too – it became more and more difficult to focus on baseball as September wore on. Not that it hasn’t been a struggle all season, but this month it’s especially difficult. We can’t even be bothered to play spoiler to other teams’ playoff aspirations. The team just appears to be letting the opposition mow over them while laying back and taking it. There were at least two grounders last night early in the game that Chone Figgins “tried” to get to – I can’t even type that with a straight face. Figgins once again displayed the sort of lazy play that Don Wakamatsu tried to bench him for a while back. Good thing we’re paying him a lot of money to play like that. I’d hate to not pay him enough. Tom and I went to the game last night, and were sitting in section 107, about 4 rows down from a large group of Japanese women and girls who were very obviously Ichiro fans. You may have seen them on the FSN broadcast at the end or beginning of various innings, standing up and cheering, and holding several large signs in Japanese, one of which said “NFCC”. I’ve attempted to look that up, but the results were unsatisfactory. What you didn’t see on TV was the ensuing hysteria that happened the two times Ichiro pointed at them, and the multitudes of point-and-shoot cameras that showed up every time he was in the outfield, at the plate, running down a fly ball, stretching, breathing…and you likely didn’t see the act of one Boston fan that absolutely stunned me – and I’m not talking about the idiot that interfered with a ball in play that gave David Ortiz a double. 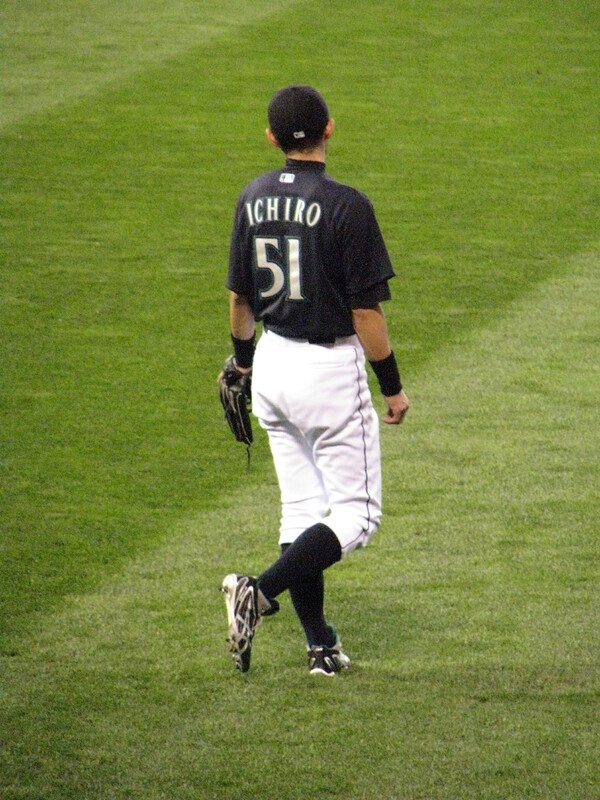 There was one point in the game last night where, after the third out had been accomplished by Ichiro catching a fly ball, he threw the ball in the direction of his some 50 female fan club. It fell short, and into the hand of a man with his wife and baby who were all decked out in Red Sox gear. He held the ball aloft for everyone in our section to see, smiling. The girls in back of him looked sad for a few seconds, but not for long – this guy turned around and gave it to one of the girls, causing her and three of her friends to screech in delight, and jump up and down in unison. I wish I would have captured it on film, because it was possibly one of the coolest things I’d seen during a ball game, and it just about made my night, loss of 6-1 or no. Yes, those are vitamins off to the side. Back off, I’m trying to be healthy. In any event, major thanks to Gregg and company, I really appreciate it. Hopefully I can find a place in our living room to display it…much to Tom’s chagrin. 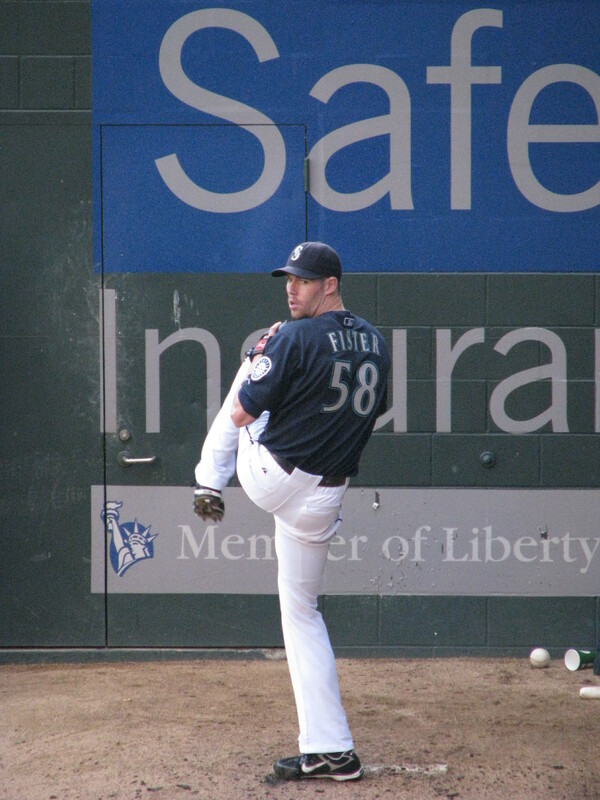 Doug Fister warming up pre-game. I know that there are some people that it probably bothers, but Fister is one of my favorite as far as pitching form. He just looks like a ballet dancer out there, one of the more interesting pitchers to photograph, in my opinion. The view of center and left from our seats as the sun went down. I’m pretty sure I’m going to print this one eventually. 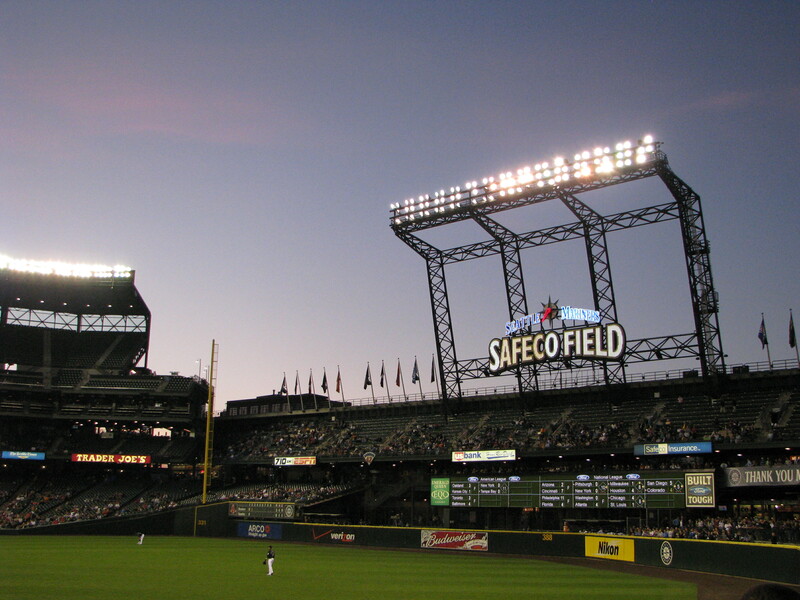 One of my favorite views of SafeCo Field. 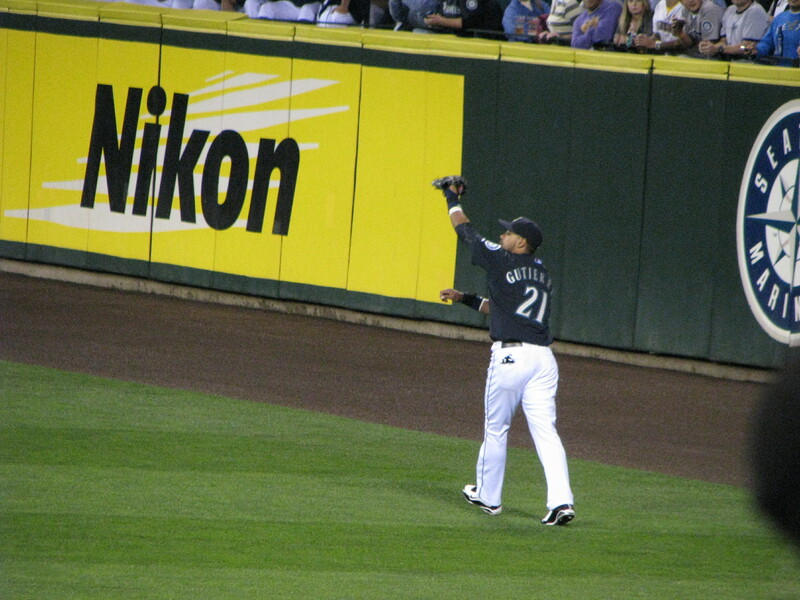 This is an awful shot, but there is indeed a ball in Gutz’s glove there – he’d just caught it. Wish I could have gotten one that was a bit more dramatic, but I’ll take what I can get. I guess that the only thing we have to look forward to this season is that Felix Hernandez is a possibility for the Cy Young Award again. The thing that is lame, however, is the fact that his low win numbers are keeping some of the voters for voting for him. I’m not saying this because I’m a Mariners fan; if CC Sabathia had better numbers all ’round, sure, he should get it. But wins are not something a pitcher’s performance should be measured by (something I learned very quickly), just like ERA is not an accurate ruler of a pitcher’s skill. It is unfortunate that this situation may turn into a SABR vs. traditionalist argument, rather than merely voting on the best pitcher for 2010, who is, rather obviously, Felix Hernandez. People are choosing to ignore that science exists that can prove their precious old school statistic wrong, and there is very little that annoys me more than willful ignorance. At least it looks like people who read FanGraphs know what’s what. 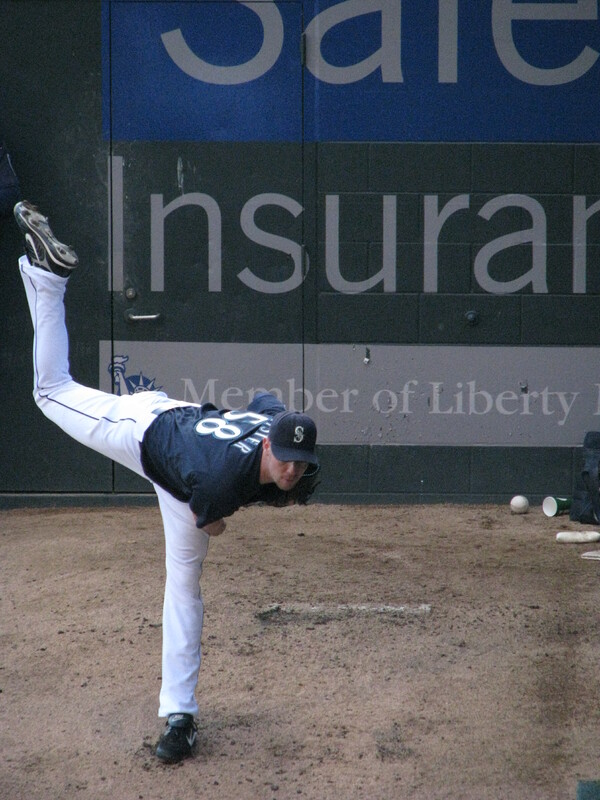 Luke French pitching for the Mariners against Daisuke Matsuzaka. French has fewer wins but a lower ERA. Luke French will likely lose. I’m 99% sure that I was sitting a few seats down from you. I was in front of the Japanese girls, directly in front of the Boston fan who caught the ball. As I was leaving once, I squeezed by you and you had your camera and dyed hair. I considered saying, “Do you write section331.com?” but realized how strange I would seem if I were wrong. Now I wish I would’ve! Yeah, I guess if nothing else, people who are there to see individual players can make a bit of difference with the atmosphere. This year makes me miss last year, when everyone was happy and there was winning happening, and we could foil other team’s playoff hopes, and other teams’ reporters were sitting up and taking notice at our success story. 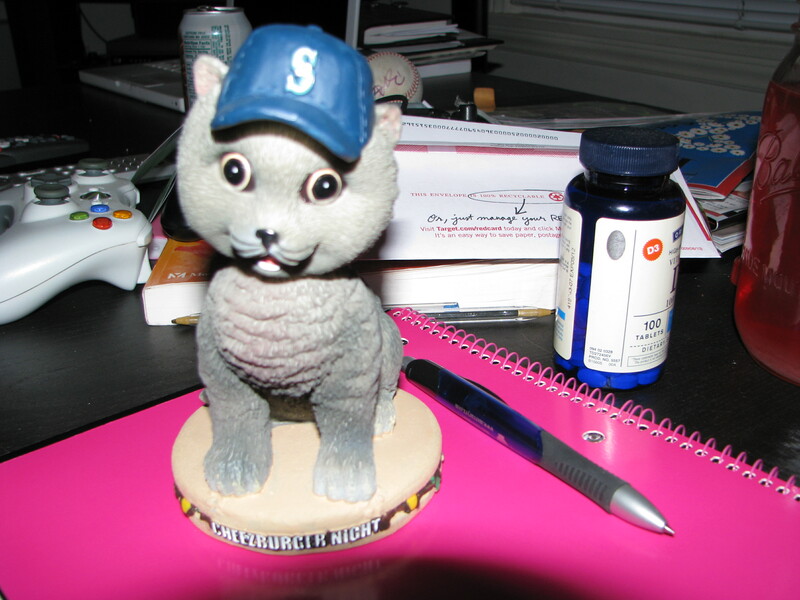 I am jealous….Cheezburger Bobblehead is one of the Mariners items I am still looking for. I thought you went to Cheezburger Night? No? The cat is kinda cute, but what the heck is cheezburger night? There’s a Seattle-based website called icanhazcheezburger.com, and the whole thing is pictures of cats with captioning on them. They have one for dogs, celebrities, sports, politics, etc, and also a lot of other links to pages for funny stuff like failbook.com and others. I guess last year the creators of the original site talked to the marketing department to set a discount night up. Last year, people got shirts – this year, it was a bobblehead. There was also a really hilarious game thread on LookoutLanding last year where people were pasting Jeff’s face over cat bodies and all these .gif images. I think the last time I laughed so hard at any thread was the Nyger Morgan meme.